Magearna in game: 599 Who? Important notice! Pokemon Magearna is a fictional character of humans. Magearna (Japanese: ???? Magearna) is a dual-type Steel/Fairy Mythical Pokémon introduced in Generation VII. 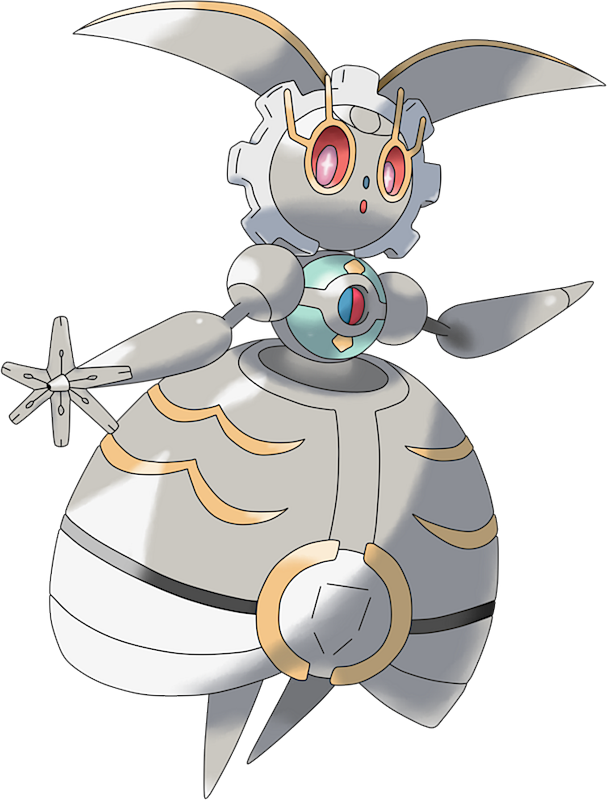 Magearna is a metallic, bipedal Pokémon that is made up primarily of spheres. Its head is a medium-sized sphere with a slight point in the back. Around its head is a gear with seven teeth, but the gear does not cover its chin. It has two large, rabbit-like ears with gold rims, a tiny nose and mouth, and light red eyes with pinkish ovals in the center. In the centers of the ovals are white crosses, and thin gold wiring encircles each eye with two small prongs similar to eyelashes. The rabbit-like ears appear to be two halves of a large disc held together by a hinge at the top. Magearna's upper body is similar to a Poké Ball: it is divided into two light blue portions by a thick gray band. In the front center of the band is a circular depression that is half-blue and half-pink. Above and below the depression, in the light blue portions, is a yellow, diamond-shaped marking. On either side of its upper body is a large, spherical shoulder with thin upper arms that lead to large, claw-shaped forearms and slightly pointed hands. Its lower body is a much large sphere that resembles a ball gown. There is a pair of golden, wavy lines on each side of this sphere, which is divided down the front and back by a gray line. In the back, there is a solid gold ring with a hole in the center at the bottom of this line. The front has a gold ring as well, but it is broken at the top and bottom and has a shield shape in the center. Metal plates similar to the ruffles of a dress adorn the bottom of its lower body, and it has two pointed legs. Magearna was breed by a scientist 500 years ago. The sphere in this Pokémon’s chest is known as the Soul-Heart, and the scientist breed it by collecting life energy from Pokémon, and is the true body of Magearna. It will try as hard as it can to save injured Pokémon, due to its ability to feel other's pain. It can even perceive the emotions, thoughts, or feelings of other Pokémon as well. When it’s sleeping or sometimes when it is sad, Magearna can take on the appearance of a Poké Ball. Back when it was invented, Magearna's body was primarily painted gold, though a lighter tone than the highlights and rims that adorn its body. The ears and the top half of its lower body were painted red, matching the coloration of an ordinary Poké Ball. Magearna made its debut appearance in the anime in the third XY series movie, Volcanion and the Mechanical Marvel. During the events of the film, it was kidnapped by Alva, prompting Volcanion to set out on a mission to rescue it. Magearna is the only Pokémon that can learn TMs outside of moves it learns by leveling up, but cannot learn Toxic. 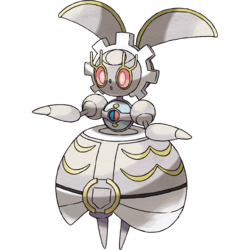 Magearna is likely based on a karakuri puppet and a rabbit. It also may be inspired by a nursemaid, a young woman that would care and look after children within the community of a large household, having historically worked in medieval castles. The gear around Magearna's head also resembles a maid's headdress as well as its central body looking similar to the common wear for a maid, such as its arms looking like long, puffed sleeves and the black divide near the end of its "gown" bearing resemblance to the end of an apron. Magearna may be a combination of gear and mana, and may be a corruption of machina, Latin for machine.